With over 36 years of experience in his hands, Dr. B.M. Lava is one of the most reliable general physician and pediatrician working in JP Nagar 5 Phase, Bangalore. 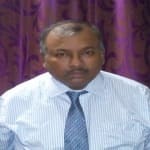 Currently, he is associated with Lava's Clinic in JP Nagar 5 Phase, Bangalore. Dr. lava finished his MBBS from St. John's Medical College, Bangalore in 1980. In 1983, Dr. Lava received his Diploma in Child Health from St. John's Medical College, Bangalore. A well-revered name in his field, Dr. lava is a professional member of many prestigious associations including Indian Medical Association, Indian Academy of Pediatrics and Bangalore pediatric society. In his long and illustrated career, he has provided optimal care and efficient service to all of his patients. In his own clinic, he extends the same formal atmosphere and efficient service to his patients. Here you can get services for a whole range of services including Smoking Cessation Treatment, Tetracycline Staining Treatment, Weight Management Treatment and Allergy Treatment, Childhood Infections and vaccination among others to get wholesome cure for you or your child. You may visit Dr. Lava in person or you may opt for booking online or through phone calls. I remember, I read an article of B.M Lava in the paper and made contact. B.M Lava is really like god send person. I have consulted so many doctors but nobody till now was able to understand my concern properly, until i consulted B.M LavaThe Lava's Clinic and Vaccination Centre is designed in such a manner that all requirements of patients are taken care of. The Lava's Clinic and Vaccination Centre was equipped with various facilities. Overall treatment for gastric problem was very effective. I consulted a number of specialists but the way he treated me was the best Thanks to him I am much better now. I was in so much pain due to my headaches. My previous experiences were not so good, but Dr B.M Lava has completely changed my opinion as he is very helpful and humble. It has been quite some time that i was suffering from headaches. But after consulting him I feel quite better now. The Lava's Clinic and Vaccination Centre is well maintained . Dr B.M Lava certainly knows the in and out of his speciality. Overnite my difficulty sleeping aggravated. I found the Lava's Clinic and Vaccination Centre itself quite pleasant. It has been quite some time that i was suffering from difficulty sleeping. I am so happy with the results of my treatment, that I will surely recommend B.M Lava to anyone gladly. Over the period of time the difficulty sleeping treatment has helped me a lot. I found the answers provided by the Dr. B.M Lava to be well-reasoned. I can understand the importance of a physical evaluation by the concerned doctors! I found the answers provided by the Dr. B.M Lava to be professional. Thanks for exact professional reply for my question Sir. I found the answers provided by the Dr. B.M Lava to be knowledgeable. Good , ya Dr we vacinated her with the chicken pox . I found the answers provided by the Dr. B.M Lava to be nurturing. Only plain rice, dal , chapati . No non veg. Dr. B.M Lava provides answers that are very helpful. I was really happy to get the consultation soo quick. I have fever from 2-3 days when I take paracetamol then it gone. But after some time it happen again .prescribe me medicine. I have been using betnovate n for last 7-8 yrs. But when I don't use it, there becomes rashes redness on face and feels itching on face. I have consulted a skin specialist. He gave me momisoft cream and uvrid nf sunscreen n some other tablets for 10 days. After 10 days he gave me lutica and same uvrid nf sunscreen for 15 days. I was feeling good bcz it was healing. Then he gave me desolim cream and uvrid nf sunscreen. That time I was in Rajasthan so I didn't get any problem. Now I am in Guwahati. There is humidity in guwahati. So medicine is not working here. I got rashes n redness again on face. I consulted immediately to skin specialist here. He gave me eumosone and some other tablets (cfm 500 mg, candimore,mantrayx L, predace 8 mg). But they are also not effective. Rashes n redness is still there and I feel itching on the face. What to do sir? I want to get rid of this problem at any cost. Please suggest me. Sir, Do you have any triggering factors. Avoid Sun. Are you taking any regular medicines. Drink plenty of water fruit juices. Eat plenty of vegetables and fruits, dry fruits You need to be examined for proper medical advice. Good evening sir, nephew one is 2 years old and another one is 4 years old, they are suffering from chicken pox, so please suggest me which foods are best to intake and medications and how to recover early. I hope you respond as early as possible. Thank you sir. Sir, Let them be in isolation, till skin lesions are dried up. How come the parents have not given chicken pox Vaccine! Give high protein diet. Lot of water, vegetables, fruits, dry fruits. For medication, I need to know duration of the illness, any fever, photo of the affected area. Contact me immediately for proper medical advice. I am having 35 years old, 12 years back I have taken trances operation, still frequently I am suffering throat pain and cold some times cough addition now from last 3 months suffering with throat infection I have take antibiotic tablets getting down and again coming back. Now I am still suffering sore throat and throat and nerves having reddish colour and, now from 2 days onwards added cold, mucus cough and throat pain. Sir, Drink lukewarm water. Do gargling 3 times per day with warm salt water. Avoid polluted atmosphere. Eat plenty of vegetables and fruits Contact me for any clarification. I am suffering from fever since 4 days. Before 2 days I have cold I took erythromycin tablet with paracetamol I gave relief but I have fever till now. Now tell me some easier method for relief. Sir, Drink plenty of water fruit juices butter milk Take rest at home Check temperature 4 times per day Contact me with details for proper medical advice. Hi dr, I am a nurse. 3 days before I ate very spicy food containing full of green chilli when I ate I had burning sensation over my mouth and stomach. I ate only 3 bites. Due to burning sensation I stopped. Now for 2 dayd I have painful mouth ulcers and pain during swallowing. Reflux of food. Excessive burping daily which is disgusting. But I don't have abdominal pain and all. My appetite is good. Noo vomiting. Where do I have ulcer? Oesophagus or stomach. What medication shall I take. Madam, Apply Anaben liquid to mouth ulcers. Take antacid and antiflatulant liquid 3 times per day. Contact me for any clarification. Sir, My brother has fever approx 104-105 and its fluctuating. All reports are negative. Doctors said its a viral fever. So please suggest me some precautions to maintain it. Thanks. Sir, Let him drink plenty of water, home made juices. I need more information from you for proper medical advice Tell me duration of the problem, treatment taken, lab reports. Get back to me with details through Lybrate. Nutrition for you will never be as important to you as it is during pregnancy, because while eating you have to think not only about you, but also the development of your unborn child. However, merely eating is not enough you have to eat right. Here is your guide of what to eat and what to avoid, during pregnancy, so that your child gets the best nutrition. Whole grains: Whole grains, which can be found in food items like cereals, whole-wheat breads and pastas, are rich in folic acid, iron and fibers. Make sure you incorporate ample amount of whole grains in your diet to remain healthy during pregnancy. Beans: Beans are extremely nutritious for pregnant women, as they contain protein, fiber, iron, folate, zinc and calcium, which are much needed for the development of a healthy baby. Fish: Incorporate enough fish in your diet because they contain healthy omega-3 fatty acids. Salmon, for example, is exceptionally good for health since it contains less mercury than other fish. Eggs: Eggs are rich in protein, and is also a good source of other nutrients like amino acids, vitamins and minerals, including choline which is crucial for the baby's brain development. Berries: Berries contain vitamin C, calcium, folate and fiber, which is important to your diet, besides being a delicious addition to your meal. Low fat yogurt: Sweetened yogurt is extremely bad for your health, but a cup of plain, low fat yogurt contains copious amount of calcium and is also a good source of proteins. Soft cheese: Soft cheese, like feta, blue cheese, brie, etc. are made of unpasteurized milk, which contain listeria bacteria which might be fatal for you and your child. Hence, they are best to avoid. Undercooked or raw food: Raw meat may contain toxoplasma and other bacteria. Raw eggs in sauces like mayonnaise, uncooked dough, desserts like tiramisu and salad dressings are also harmful for you. Fish in sushis or self caught fish may also contain harmful bacteria and parasites or chemicals released from nearby factories. Do ensure that your meat and fish are thoroughly cooked while dining out as well. Unpasteurized juices: There is always a risk of juices, which are squeezed and unpasteurized, being contaminated with E-coli or salmonella, which can be very harmful for you. Pre-dressed poultry: Poultry that has been dressed and stuffed at the market often run the risk of being contaminated by the juices of slaughtered poultry, proving to be best breeding grounds for bacteria. Unwashed fruits and vegetables: Toxoplasma can breed on unwashed raw foods, which also cause harm to your health, mainly in the prenatal period. Alcohol, coffee and unpasteurized milk: These beverages have been deemed unsafe for pregnant ladies since they can cause severe health damages. If you wish to discuss any specific problem, you can consult a general physician. I am getting cough due to acid reflex pl suggest medicine. I am 58 male Engineer by profession self employed. Sir, Have regular timings for eating. Avoid spicy and oily food. Do not sleep for 2 hours after eating. I need more information for proper medical advice. Tell me treatment taken Do you have any breathing problem, Contact me with details through Lybrate either by chat or audio call. I have been suffering fever from last one month even I can't wake up and a lot of cold also so please give me some suggestion. Sir, Take lot of water, fruits and juices. 1 month is quite a long duration. Immediately you require investigations to know the cause of prolonged Fever. Do not DELAY, Contact me Immediately through Lybrate either by chat or audio call.